The Book of Tobit (/ˈtoʊbɪt/)[a] is a book of scripture that is part of the Catholic and Orthodox biblical canons. It was pronounced canonical by the Council of Hippo (in 393), the Councils of Carthage of 397 and 417, and the Council of Florence (in 1442), and confirmed in the Counter-Reformation by the Council of Trent (1546). It is not found in Protestant or Jewish biblical canons. The Book of Tobit is listed as a canonical book by the Council of Rome (382 AD), the Council of Hippo (393 AD), the Council of Carthage (397) and (419 AD), the Council of Florence (1442) and finally the Council of Trent (1546), and is part of the canon of both the Roman Catholic Church and Eastern Orthodox Churches. Roman Catholics often refer to it as deuterocanonical. Augustine (c. 397 AD) and Pope Innocent I (405 AD) affirmed that Tobit is a part of the Old Testament Canon. Athanasius (367 AD) mentioned that certain other books, including the book of Tobit, while not being part of the Canon, "were appointed by the Fathers to be read". According to the monk Rufinus of Aquileia (c. 400 AD) the book of Tobit and other deuterocanonical books were not called Canonical but Ecclesiastical books. Article VI of the Thirty-Nine Articles of the Church of England lists it as a book of the "Apocrypha". Protestants regard Tobit as apocryphal because it was not included in the Tanakh nor considered canonical by Judaism. Before the 1952 discovery of Aramaic and Hebrew fragments of Tobit among the Dead Sea Scrolls in a cave at Qumran, scholars believed Tobit was not included in the Jewish canon because of late authorship, estimated to 100 AD. Qumran fragments of the text, which were copied between 100 BC to 25 AD, evidence a much earlier origin than previously thought. These fragments evidence authorship no later than the 2nd century BC and, likely, contemporary with the date ascribed, by modern scholars, to the final compilation of the Book of Daniel, which did attain canonical status. Other scholars have postulated that Tobit was excluded from the Jewish Scriptures for a halakhic reason because Raguel, the bride's father, wrote the marriage document discussed in 7:16, instead of the bridegroom, as required by Jewish rabbinical law. However, it could be hypothesized that some ancient Jewish rabbinic scholars considered Tobit to be historical. Midrash Bereishit Rabbah, an aggadic commentary on the Book of Genesis compiled circa 400–600 AD, includes a truncated Aramaic version of Tobit. Tobit was also considered part of the Septuagint (the Greek translation/interpretation of the Hebrew Bible). In more contemporary times, a number of Jews in Israel have sought to reclaim Tobit as part of the canon. This book tells the story of Tobit, a righteous Israelite of the tribe of Naphtali, living in Nineveh after Sargon II had deported the northern tribes of Israel to Assyria in 721 BC. In the two Greek versions, the first two and a half chapters are written in the first person; in the Vulgate version, they are written in the third person. 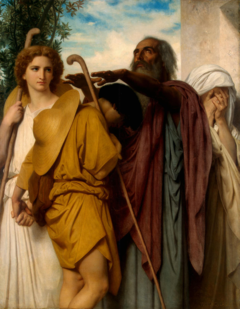 Tobit, raised by his paternal grandmother, Deborah, remains loyal to the worship of God at the temple in Jerusalem, refusing the cult of the golden calves that Jeroboam, king of Northern Israel, set up at Dan. He is particularly noted for his diligence in attempting to provide proper burials for fallen Israelites whom Sargon's successor, Sennacherib, has slain. For this behavior the king seizes his property and exiles him. After Sennacherib's death, Tobit is allowed to return to Nineveh, where he buries a man who has been murdered on the street. That night, he sleeps in the open and is blinded by bird droppings which fall into his eyes. The blindness caused by this injury strains his marriage and, ultimately, he prays for death. Meanwhile, in faraway Media, a young woman named Sarah has prayed for death in despair. The demon of lust, Asmodeus ("the worst of demons"), abducts and kills every man Sarah marries on their wedding night before the marriage can be consummated. God sends the angel Raphael, disguised as a human, to heal Tobit and free Sarah from the demon. The main narrative is dedicated to Tobit's son, Tobiah or Tobiyah (Greek: Τωβίας Tobias), who is sent by his father to collect money that the elder has deposited in distant Media. Raphael presents himself as Tobit's kinsman, Azariah, and offers to aid and protect Tobias. Under Raphael's guidance, Tobias journeys to Media with his dog. Along the way, while washing his feet in the river Tigris, a fish tries to swallow his foot. By the angel's order, he captures it and removes its heart, liver and gall bladder. Upon arriving in Media, Raphael tells Tobias of the beautiful Sarah, whom Tobias has the right to marry because he is her cousin and closest relative. The angel instructs the young man to burn the fish's liver and heart to drive away the demon when he attacks on the wedding night. The two marry, and the fumes of the burning organs drive the demon to Upper Egypt, where Raphael follows and binds him. Sarah's father had been digging a grave to secretly bury Tobias under the assumption that he would be killed. Surprised to find his son-in-law alive and well, he orders a double-length wedding feast and has the grave secretly filled. Since the feast prevents him from leaving, Tobias sends Raphael to recover his father's money. After the feast, Tobias and Sarah return to Nineveh. There, Raphael tells the youth to use the fish's gall to cure his father's blindness. Raphael then reveals his identity and returns to heaven, and Tobit sings a hymn of praise. Tobit tells his son to leave Nineveh before God destroys it according to prophecy (compare the Book of Nahum). After the prayer, Tobit dies at an advanced age. After burying his father and mother, Tobias returns to Media with his family. Readings from the book are used in the Latin Rite. Because of the book's praise for the purity of marriage, it is often read during weddings in many rites. Doctrinally, the book is cited for its teaching on the intercession of angels, filial piety, and reverence for the dead. The story in the Book of Tobit is set in the 8th century BC. However, a number of historical errors (according to Miller, though some may dispute this) rule out contemporaneous authorship, and most scholars now date the book's composition between 225 and 175 BC. The direct quote in Tobit 2:6 from the Book of Amos ("Your feasts shall be turned into mourning, and all your mirth into lamentation") indicates that the prophetic books had become not only fixed but authoritative, signalling a post-exilic date. Moreover, reference to the "Book of Moses" (6:13, 7:11–13) and the "Law of Moses" (7:13) echo identical phrasing in the Book of Chronicles, which some believe was composed after the 4th century BC. Contextually, dating Tobit's authorship to after 175 BC is problematic, as the author expresses no awareness of Seleucid attempts to Hellenize Judea (from 175 BC) or of the Maccabean Revolt against the Seleucids (165 BC), nor does it espouse apocalyptic or messianic expectations upon which later writings focused. Nevertheless, some scholars espouse a later date of composition of at least portions of Tobit. No scholarly consensus exists on the place of composition, and "almost every region of the ancient world seems to be a candidate." A Mesopotamian origin seems logical given that the story takes place in Assyria and Persia, as does the invocation of the Persian demon "aeshma daeva", rendered "Asmodeus" by Tobit. But significant errors in geographical detail (such as the distance from Ecbatana to Rhages and their topography) render this origin questionable. Arguments against and in favor of Judean or Egyptian composition also exist. The original language of composition remains unclear. Tobit may have been originally composed either in Aramaic or Hebrew, since fragments of Tobit in both languages have been discovered at Qumran. The book is closely related to Jewish wisdom literature. This is especially clear in Tobit's instructions to Tobias before his departure for Media in Chapter 4, which particularly praise the value of prayer, fasting, and almsgiving. Leaf from a vellum manuscript, c. 1240. As stated, fragments of Tobit in both Aramaic and Hebrew have been discovered at Qumran. Jerome described his version for the Vulgate as being made from an Aramaic text available to him. Surviving Greek translations are found in two versions. The shorter, which Robert Hanhart called Greek I in his edition of the Septuagint, is found in Codex Vaticanus, Alexandrinus, Venetus, and most cursive manuscripts. The Greek II version, 1700 words longer, is found in Codex Sinaiticus and closely aligns with the Hebrew and Aramaic fragments found at Qumran. Apparently the Old Latin (La) manuscripts are also translated from the longer Greek II version. Most English translations since 1966 have relied on the Greek II version. ^ from the Greek: Τωβίθ Tōbith or Τωβίτ Tōbit, itself from Hebrew: טובי‎ Tovi "my good"; Book of Tobias in the Vulgate from the Greek Τωβίας Tōbias, itself from the Hebrew טוביה Tovyah "Yah is good"
^ Τωβείθ and Τωβείτ spellings are also attested; see iotacism. ^ B. F. Westcott, A General Survey of the History of the Canon of the New Testament (5th ed. Edinburgh, 1881), pp. 440, 541-2. ^ Eccumenical Council of Florence and Council of Basel Session 11—4 February 1442. ewtn. Retrieved 20 October 2016. ^ of Hippo, Augustine. On Christian Doctrine Book II Chapter 8:2. newadvent. Retrieved 12 October 2016. ^ Westcott, Brooke Foss (2005). A general survey of the history of the canon of the New Testament Page 570 (6th ed.). Eugene, Oregon: Wipf & Stock. ISBN 1597522392. ^ of Aquileia, Rufinus. Commentary on the Apostles' Creed #38. newadvent. Retrieved 12 October 2016. ^ "Anglican Articles of Religion". Anglicansonline.org. 2007-04-15. Archived from the original on 2007-06-25. Retrieved 2014-03-11. ^ "Scrolls Content". The Dead Sea Scrolls. Retrieved 2014-03-11. ^ R. Glenn Wooden, "Changing Perceptions of Daniel: Reading Chapters 4 and 5 of Daniel", in From Biblical Criticism to Biblical Faith, Brackney & Evans eds., p. 10 (Mercer Univ.Press 2007) ISBN 0-88146-052-4. ^ Mark Bredin, Studies in the Book of Tobit: A Multidisciplinary Approach, p. 3 (T&T Clark 2006), ISBN 0-567-08229-6. ^ Septuaginta: Editio altera/Revised Edition, 2006: Deutsche Bibelgesellschaft, Stuttgart, pp. 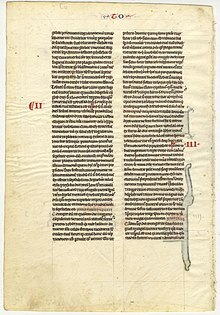 1002-1039; Biblia Sacra Vulgata, vierte, verbesserte Auflage 1994: Deutsche Bibelgesellschaft, Stuttgart, pp. 676-690. ^ "Tobit 6 GNT – Tobias Catches a Fish – So Tobias and". Bible Gateway. Retrieved 2014-03-11. ^ a b c "Book of Tobias". Catholic Encyclopedia. 1909. ^ Miller, at p. 10. ^ Miller, at p. 11. ^ a b Fitzmyer, at p. 51. ^ Fitzmyer, at p. 51; Miller, at p. 11. ^ Fitzmyer, at pp. 51–52; Miller at pp. 11–12. ^ Fitzmyer, at p. 52. ^ a b Miller, at pp. 12–13. ^ Miller, at p. 13. ^ Miller, at pp. 12–15. ^ Four Aramaic fragmentary texts of Tobit (4QToba–dar [=4Q196-199]) and one Hebrew text (4QTobe [=4Q200]) were found at Qumran in Cave IV. Wikimedia Commons has media related to Book of Tobit. Milbank, Alison; Talbert, Andrew (2010). "Tobit". Bibledex: Deuterocanonical Books. Brady Haran for the University of Nottingham. "Tobit, Book of" . New International Encyclopedia. 1905.